in the June 6, 2014 Timberjay HERE! in the October 10, 2014 Timberjay HERE! Thanks for a wonderful day on Trout Lake. I'm a little late in doing so, but wanted to thank you again for a great fishing outing on Friday, July 6th. Pete and I had a great time and our families loved the fish fry we had with our catch. I just wanted to thank you for our trip yesterday. JoAnn and I had a great time. I would recommend it to anyone. Your shore lunch is second to none! Just touching base with you following our Lake Vermilion trip. 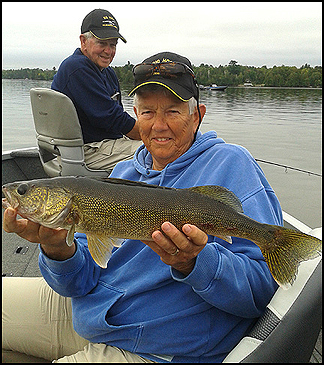 We want to thank you for the guide service and a good day of walleye fishing. The trip went just the way I wanted. She got to catch some nice Smallmouth and we had a blast! Just wanted to say thanks!! Wanted to drop you a line to say thanks for a great day on the water. 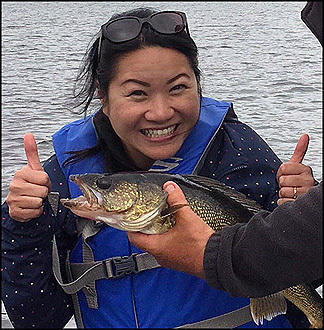 Diana and I had a great time, meeting and talking with you and catching fish. I learned a lot just by observing what kind of structure, bottom and areas you took us to, which helped me get us on more fish in the following days. Thanks so much for that!